Project Welcome home is my Brain Child on this site.. what is it? I believe that no other veteran in the nation's history was mistreated and under-acknowledged for his sacrifices during a time of war, such as the Vietnam Veteran. The nation as a whole was in great denial, as also was our government which refused to declare the war more than a "Police Action". Many of our young men, upon returning to the "World", found themselves, instead of appreciated, declared as "baby killers" and spat upon and treated like the enemy instead of decorated war heroes, which I feel they were and are. Many couldn't find decent work, if they found any at all. Many languished this way for years after the end of the struggle in 1975. And still more continue to languish in mental institutions; living on the streets of many major cities; in prisons, VA Hospitals, or are recluses living in far away places, hiding from the world; places like the Philippines, Thailand, Alaska, Mexico, etc., and even in Vietnam! Such treatment by society, caused many of us to go into a denial of sorts, by hiding our veteran status, and trying to blend into society.. which we found out later, just didn't work. Where we should have felt pride in our service, we actually felt shame: We found ourselves a group of men and women, bearing collective guilt, instead of decorated veterans and heroes, as were the past WWII veterans. I would not take away the honor and distinguishment of WWII Veterans who have been called, "The Greatest Generation" but I also believe that those who struggled in Vietnam for the ten years of that struggle should be peers with the former Generation who struggled in WWII. Korea too became America's Forgotten War" - which causes me to wonder, "What is wrong America? How can a Nation so blessed be so short sighted and foregetful?" This self-inflicted guilt and denial on our part, caused us many years of what has come to be known as Post Traumatic Stress (PTSD), because, instead of talking out our problems and experiences in that unpopular war, we were forced to keep it inside, which only magnified and exacerbated the emotional trauma. 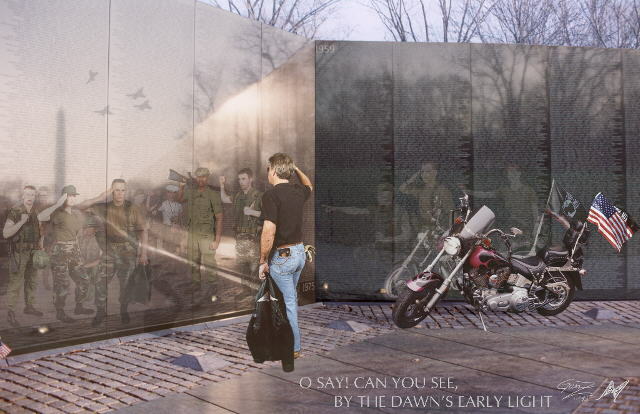 Project Welcome Home is my way of telling all who visit my Tribute Site and Homepage, the next time they encounter a Vietnam Veteran, to give him a hearty and heart-felt 'Welcome Home' and thank him or her for their service to our country in Vietnam. If anyone knows of Hugh's location or another Link for this Site, please let the Yeoman know. Meanwhile visit the only TGYC Website still operating on their own steam - click the Logo. I'd like to add an addendum to the above 'lament' as of 2012...The Vietnam Veterans are today receiving the long-awaited-for acknowledgement for their struggle in that far-off little country in southeast Asia; and many today are saying to them, "Welcome Home" - thanks in great part to a Thankful Nation coming awake during another generation's ten-year long struggle taking place first in Iraq and then continuing in Afghanistan. These Veterans today are not forgotten, but are receiving the Welcome Home that was so long overdue the Vietnam Veteran. Along with these current Veterans, all veterans today are being remembered for their great sacrifices. This I am happy to report and acknowledge. The Political climate in a 2008-2012 America has changed Americans into Patriots that par no other generation since. I am happy that many of us are saying today, "Never again, will one generation of Veterans abandon another." And hopefully, never again will we be found asleep at the Wheel in this country. Never again will we not vet a future President, and never again will we allow a Congress to work only for their own selfish aggrandizements. May we as a People remain Awake and may we come to the day when all War and Bloodshed will come to an End. May God Bless us all for this Awakening and also for a Hope in such a Future, and may "Old Glory" always fly over this our country - our America the Beautiful! "It was the late 1960's. William Jefferson Clinton was in England coordinating anti-war demonstrations. Jane Fonda was astride a Chinese built anti-aircraft gun in Hanoi while husband, Tom Hayden and Ho Chi Minh cheered her on. All of this while the Hanoi Hilton was home to some of the best and bravest that America had to offer. "Meanwhile, some 500,000 Soldiers, Sailors, Marines and Airmen were writing a new page in the history of military warfare in South Vietnam. Special Forces, Navy Seabee's, B52 crews, United States Marines, Air Calvary, PBR Sailors and Navy Seals, just to mention a few, were engaged in some of the toughest battles in modern warfare. Unlike the average GI in the South Pacific during World War II who saw about 40 days of combat in four years, the average GI in Vietnam saw about 240 days of combat in just one year. "There has been much written about these special groups of hero's. However, some how history has overlooked the men of the Carrier Task Groups and their support ships in the Tonkin Gulf. Our guys on "Yankee Station," often referred to as members of an elite group known as the "Tonkin Gulf Yacht Club." Our sole purpose was to support the Carrier based attack aircraft pilots charged with the most dangerous missions of the war. These were the best we had to offer; men of iron, with nerves of steel. Statistically, one out of three would not complete a deployment. Instead, they were destined to serve out the remainder of the war as a POW or worse yet, become a MIA or KIA. "The Tonkin Gulf Yacht Club is not a new idea. It has been around, unofficially, since the mid 1960's. It is my belief that the time has come to formalize the Tonkin Gulf Yacht Club (TGYC), and use it as a vehicle to recognize who we were, and what we did. Those of us who returned have a special obligation to tell the story, and never let America forget those we left behind." Thiese Pages are also a Tribute to our Allies who fought beside us. Never let it be forgotten that they were our Brothers-in-Arms and that they struggled alongside us and that their sacrifices were for the common good of all. We won't rest till we've brought them all Home! www.usshancockcv19.com - thanks! - God Bless America and her National Emblem!